Now that we had a clear bio-marker of the period of Transcendental Consciousness, the next step was to investigate, did anything special happen in the EEG during transcending? Dr. Kheireddine Badawi, a Lebanese physicist visiting from Paris, and Dr. Anne-Marie Rouzere conducted this study in collaboration with Dr. Keith Wallace and me. So what have we learned? Is there a fourth major state of consciousness, Transcendental Consciousness (TC), as Keith proposed in his doctoral dissertation at UCLA back in 1970 and published in numerous journals?1-3,25,26 The short answer is Yes. Keith found that the pattern of physiological changes during the entire period of TM was different from waking, dreaming, and sleep. Of particular interest was increased alpha1 EEG, which indicates a mind-body state of restful alertness. Subsequent research found that the alpha1 frequency during TM is coherent between all brain areas, which is correlated with a vast array of brain diversity underlying thought, behavior, and feelings—creativity, intelligence, moral reasoning, and lower anxiety. All the research until this point was on the average changes that occur during the entire period of TM practice, which is usually a mixture of several states. What about specific periods of unbounded awareness during TM practice? Our studies on the exact moment of the pure experience of Transcendental Consciousness showed that breathing all but stops spontaneously, while the EEG becomes highly coherent across the brain and across all EEG frequencies, which is referred to as global brain coherence. This tells us that moments of pure Transcendental Consciousness are just more integrated versions of what is happening during TM practice generally. . . . Furthermore, the research was laying the foundation to show that all of us are developing enlightenment. We had proved the reality of Transcendental Consciousness as a unique fourth state of consciousness. Our further research would prove that with regular TM practice TC becomes stabilized throughout waking, dreaming, and sleeping. This gives rise to a fifth unique state of consciousness: Cosmic Consciousness. Maharishi Mahesh Yogi, Founder of the Transcendental Meditation program, describes this fifth state and its physiological condition as the basis for success in any walk of life. Part 4 of Dr. Orme-Johnson's in-depth series will unfold the exciting story of the research establishing the objective, scientific verification of enlightenment in Cosmic Consciousness. Part 4 will be published in Enjoy TM News in the near future. Dr. David Orme-Johnson is one of the principal researchers on the Transcendental Meditation technique worldwide, with over 100 publications in peer-reviewed journals. He served as Director of Research of the International Center for Scientific Research, and Vice Chancellor of Maharishi European Research University. At Maharishi University of Management, Dr. Orme-Johnson was Head of the Psychology Department, Director of the Doctoral Program in Psychology, Co-Director of the Ph.D. program in the Physiology of Human Consciousness, and Dean of Research. 1. Wallace RK. Physiological effects of Transcendental Meditation. Science. 1970;167:1751-4. 2. Wallace RK. The Physiology of Meditation. Scientific American. 1972;226:84-90. 3. Wallace RK, Benson H, Wilson AF. A wakeful hypometabolic physiologic state. American Journal of Physiology. 1971;221:795-9. 23. Rouzere A-M, Badawi K, Hartman R. High amplitude fronto-central alpha and theta activity during the Transcendental Meditation technique. In: Chalmers RA, Clements G, Schenkluhn H, Weinless M, editors. Scientific Research on Maharishi's Transcendental Meditation and TM-Sidhi Program: Collected Papers, Vol. 3, paper 211. Vlodrop, The Netherlands: Maharishi Vedic University Press; 1979/1989. 24. Petsche H, Kaplan S, von Stein A, Filz O. The possible meaning of the upper and lower alpha frequency ranges for cognitive and creative tasks. International Journal of Psychophysiology. 1997;1-3(77-97). 25. Jevning R, Wallace RK, Biedebach M. The physiology of meditation, a review: A wakeful hypometabolic integrated response. Neuroscience and Biobehavioral Reviews. 1992;16:415-24. 26. Wallace RK. The Neurophysiology of Enlightenment. Fairfield, IA: MIU Press; 1986. 27. Badawi K, Wallace RK, Orme-Johnson DW, Rouzere AM. 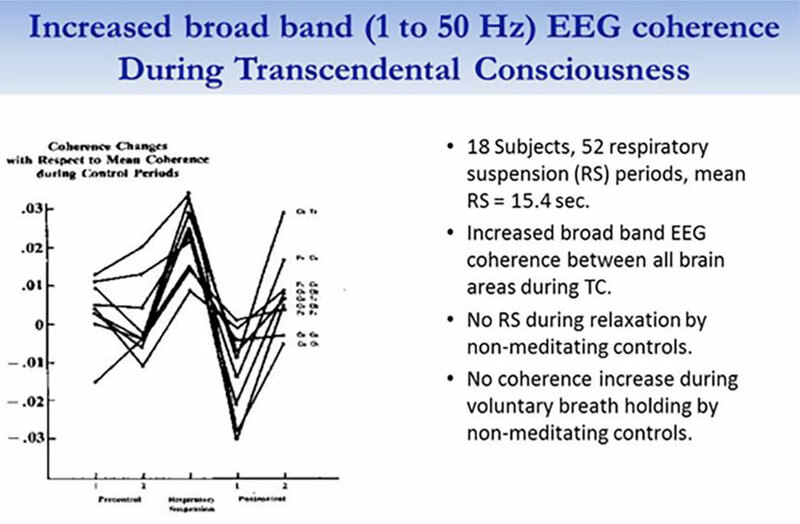 Electrophysiologic characteristics of respiratory suspension periods occurring during the practice of the Transcendental Meditation program. Psychosomatic Medicine. 1984;46:267-76. SOURCE: Original article in Enjoy TM News includes photos, scientific charts, and complete list of references.